The common or coastal brown ant. The green ant (green headed ant). 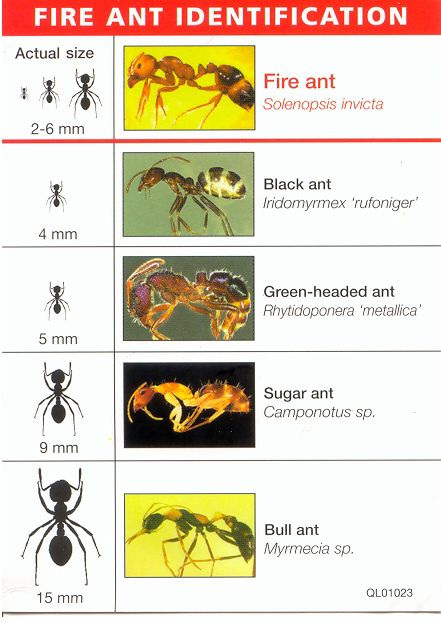 Also bull ant, fire ant and other stinging biting ants. Funnel ants - making a mess of your lawn. 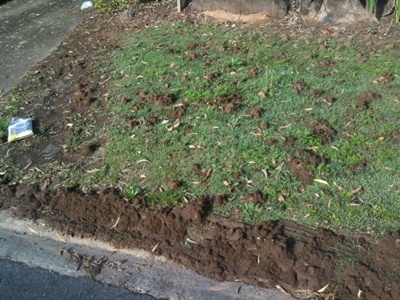 Funnel ants destroying a lawn - we can fix this easily for you. Please note: White ants are NOT ants, but correctly called termites. 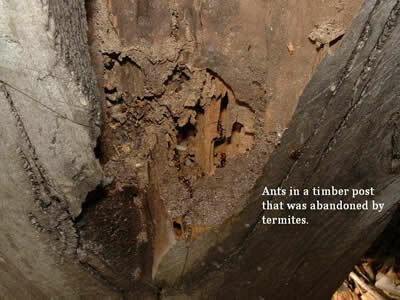 Although ants are often found in timber, they do not do any significant timber damage. Instead they live in old termite galleries, or in timber that is decaying or rotten. Brown ants are a nuisance, often raiding the kitchen to collect crumbs. Black ants are similar, but they are also likely to set up home in your walls and ceiling. An even bigger nuisance. Green ants and other biting ants generally live in the lawn and can spoil your fun in the yard if you get bitten. Funnel ants can make your beautiful lawn look like a moonscape. If you suspect for one second that you may have fire ants. Call the Department of Primary Industries immediately on 13 25 23. Ants can be treated with bait, spray or powder. We only recommend ant baits in tricky situations, as they tend to only work on certain ant species and sometimes give unreliable results. Powder is good if ants are in your roof void, or in wall cavities, but liquid chemical applied by a licensed pest controller directly to the nest is best of all. Ants in 'cathedral' ceilings are almost impossible to treat directly, so bait may be the only way to eradicate these. We treat funnel ants very successful using Termidor. Usually ants will need to be quoted before treatment as there are often tricky areas where they reside. However, a basic treatment inside to keep ants out will cost about $199. A lawn treatment for funnel ants is about $330 but may vary less if you only have a few nests or more if it is a large area. Please ring us for a quote. Often a simple cockroach and spider spray in and out will work for ants also, and will save you money if your ants are only a minor problem. Ants come with a written 3 month internal warranty and a one month external warranty. Funnel ants come with a 3 month external warranty though it will usually last much longer than 3 months.